Estimating a private company discount rate utilizes the same methods as a public company, but it is more difficult primarily due to the lack of publicly traded debt and equity to estimate necessary inputs. With no publicly traded debt, an estimated credit rating for the subject company is required to obtain a credit spread or corporate bond index yield to estimate the cost of debt. The cost of equity is commonly estimated through the application of the CAPM. However, a set of comparable companies and industry-level data is required to estimate a beta since there is no publicly traded equity for the subject company. Private company discount rates often consider small stock premiums and company-specific premiums that are not typical of public company cost of equity estimates. Comparable companies and industry-level data is analyzed to estimate a target capital structure. The overall publicly traded equities market discount rate was estimated to be approximately 5.81% as of January 2018, but any private company discount rate would be higher due to the inclusion of a small stock premium and any company-specific premiums deemed appropriate. In this article, the reader will find many resources (nearly all are free) to help with this research. Step 1: Cost of Debt: The estimated cost of debt for this privately-held building materials company was 3.40%, which assumes a credit rating of Baa for the subject company. Step 2: Cost of Equity. The modified CAPM was used to estimate a range of cost of equity of 11.25% to 14.3% for the subject company, which includes a small stock premium and no company-specific risk premium. Step 3: Capital Structure. A set of comparable companies and industry-level data was used to estimate a capital structure range of 15% to 20% debt to total capital. Step 4: Calculate WACC. Plugging these variables into the WACC formula, the estimated WACC range for the privately-held building materials company was 10% to 12%. Why Would You Need a Discount Rate for Private Company Valuation? The discount rate is a required component of any analysis utilizing cash flows to all capital holders in a DCF valuation. Business valuation of privately-held companies is commonly performed for strategic planning, potential acquisitions, gift and estate tax, stock compensation, financial reporting, corporate restructuring, litigation, among other purposes. The private company discount rate can also serve as a basis of comparison to the return on invested capital of the business to appropriately guide management’s focus on growth versus profitability to increase enterprise value. Hiring an expert with experience performing private company valuations will ensure that all unique private company characteristics are considered and appropriately applied in the estimation of the discount rate. Nowadays, an increasing number of companies are opting to stay private for longer, bypassing regulations and public stakeholders. While the total number of US companies continues to grow, the number of those traded on stock exchanges has fallen 45% since peaking 20 years ago. As reported by The Economist in 2017, the number of publicly listed companies was 3,671, down from 7,322 in 1996. Thus, private company valuation has risen to the forefront, especially since it is required for anything from potential acquisitions to corporate restructuring and financial reporting. Understanding how discount rates are estimated and their role in financial decisions is important to both private business owners/operators and investors/valuation professionals. Unlike public company valuation, private company valuation often lacks publicly available data. However, both types of valuation have something in common: usage of the discounted cash flow (DCF) analysis, which requires (1) estimation of future cash flows and (2) a discount rate. This article focuses on best practices for estimating private company discount rates, or the weighted average cost of capital (WACC), drawing on my 12 years of experience performing private company valuations and various editions of Cost of Capital: Applications and Examples. The discussion begins with an overview of the DCF analysis and the WACC, followed by detailed instruction around the components of the WACC. While this article will cover WACC as taught in accounting classes and the CFA program, it will also demonstrate how best to handle challenges encountered in practice. Perhaps unsurprisingly, a lot of classroom rules break down in the real world. And, since variables for estimating WACC are not simply pulled from a database, much analysis and judgment is required. Forecasting expected free cash flows over a projection period. Estimating a discount rate that accounts for the time value of money and the relative riskiness of the underlying cash flows. Calculating the present value of the estimated cash flows for each of the years in the projection period using the estimated discount rate. Estimating a terminal value for the expected cash flows beyond the projection period. This piece will focus on the second step. However, to illustrate the relationship between expected cash flows and discount rate, consider the following. On one hand, a US Treasury bond requires a low rate to discount the expected future cash flows, given the highly predictable nature of the cash flows (virtually risk-free). On the other hand, a technology company with more volatile future cash flows would have a higher discount rate. While risk can be accounted for by adjusting expected cash flows, the most common way is by increasing the estimated discount rate for cash flows at higher risk. Extensive analysis should support the discount rate in a DCF analysis, as inaccurate discount rates directly impact resulting valuation outputs and could lead to an inferior investment or the bypassing of a value-creating opportunity. The WACC is a required component of a DCF valuation. Simplistically, a company has two primary sources of capital: (1) debt and (2) equity. The WACC is the weighted average of the expected returns required by the providers of these two capital sources. Note that the discount rate must match the intended recipients of the projected cash flows in the DCF. That is, if the cash flows are intended for all capital holders, the WACC is the appropriate discount rate. However, the cost of equity is the appropriate discount rate if cash flows to equity holders are projected. 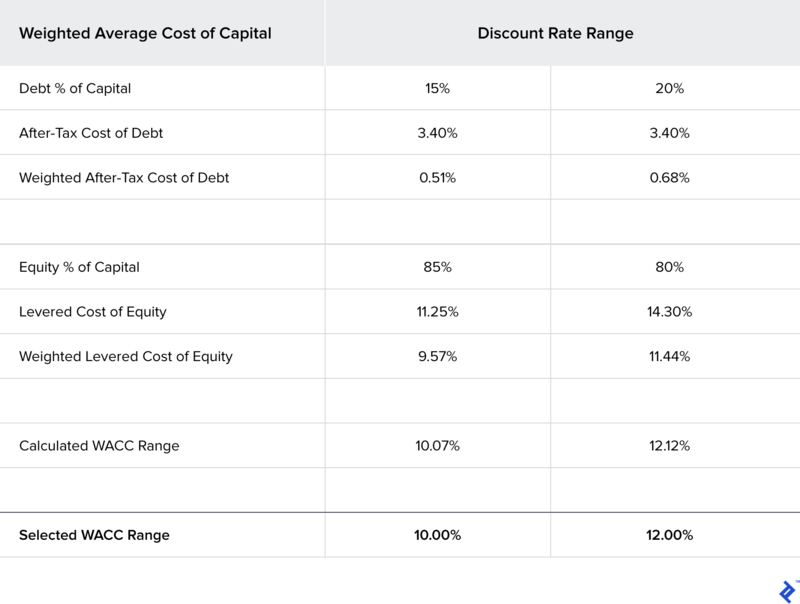 In addition to being a critical input for a business valuation, the WACC serves as a basis of comparison to the return on invested capital (ROIC) of the business. A company generates value through growth if the ROIC exceeds the WACC, but destroys value if ROIC is below the WACC. This analysis can be used by management to focus its attention on profitability or growth to increase enterprise value. While the WACC formula is relatively straightforward, a lack of transparency renders estimating the various inputs more complicated for a private company. In the following sections, I will guide you through how to estimate each component of the formula, starting with the costs of debt and equity, and their respective weights. We’ll examine a sample company (Company XYZ) throughout the remainder of the article to demonstrate how to estimate the various components of a private company WACC. The table below contains sample background information relevant for estimating the discount rate. Given the subjective nature of the inputs, there is an inherent lack of precision in estimating discount rates; therefore, it is common in practice to estimate a range of discount rates for a given company. Note that Company XYZ is a US-based company with all revenue and profits denominated in US dollars. Therefore, the estimated discount rate will be based on US inputs. It is critical that the discount rate is estimated in the same currency as the cash ﬂows (i.e., if the cash flows are estimated in a foreign currency the discount rate inputs must also be from the same country). The cost of debt is the interest rate that a company pays on its debt, which is typically based on the yield to maturity (YTM), the anticipated return on a bond if the bond is held until maturity, on its long-term debt. Private companies do not have publicly traded debt from which to derive YTM, but the cost of debt can also be viewed as the rate a prudent debt investor would require on comparable long-term interest-bearing debt. Therefore, an estimated credit rating for the subject company is necessary prior to reviewing sources for the pretax cost of debt. For public companies, there are two well-known credit rating agencies, Moody’s and S&P, which conduct due diligence of the borrowing company’s financial situation and its ability to service and repay the rated debt. 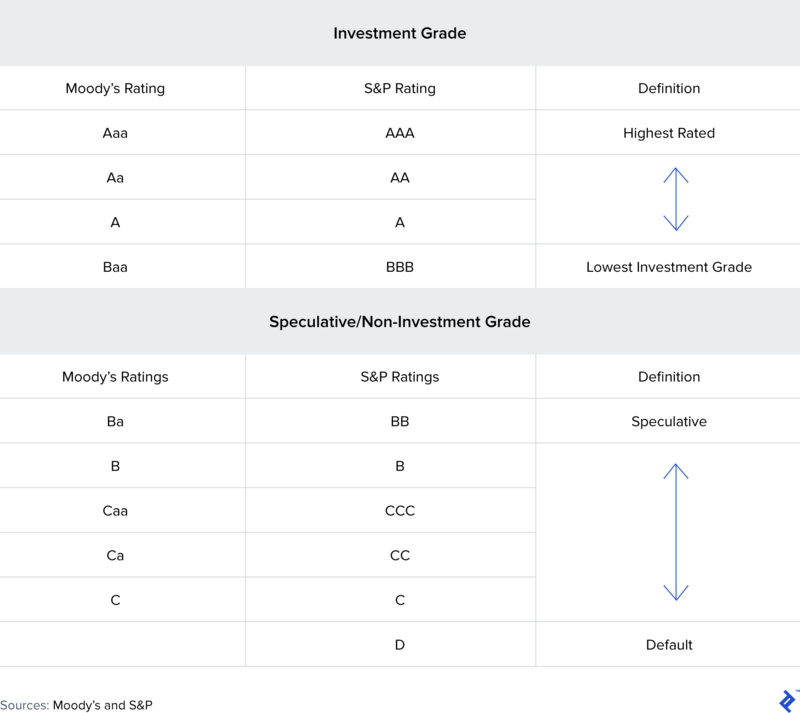 Their rating systems can be divided between investment grade and speculative/non-investment grade, with a spectrum of ratings within each category. The table below summarizes the rating systems for each agency. Method One: After a set of comparable companies has been determined, the analyst can retrieve the credit ratings for each company that has debt rated by one of the major credit rating agencies. The analyst can determine if the comparable companies should be subdivided by distinguishing features, such as relative amounts of physical collateral (or other features that could impact the interest rate on company debt). With this information, the comparable companies’ credit ratings can be used to support an estimated credit rating of the subject company. Method Two: Can be performed in a two-step process, which involves: (1) calculating the interest coverage ratio, operating income divided by interest expense, for the subject company and (2) using the resulting interest coverage ratio to estimate a “synthetic” rating that aligns with the appropriate credit rating category. While Moody’s and S&P ratings criteria are available to subscribers, Professor Aswath Damodaran of the Stern School of Business at NYU routinely publishes interest coverage ratios by credit ratings to his website. With an estimated credit rating established, the bond yields of published corporate bond indices can be used to estimate the pretax cost of debt. For example, using the information provided above for Company XYZ, the interest coverage ratio (latest and three-year average) falls within the range of 4.0 to 4.49 of the Baa credit rating. The pretax cost of debt, as estimated by the Moody’s Baa corporate bond yield, was 4.59% as of March 29, 2018. Since the interest payments on debt capital are deductible for income tax purposes, the pretax cost of debt is adjusted for the expected marginal tax rate. The recently signed Tax Cuts and Jobs Act of 2017 will impact valuation analyses through both expected after-tax cash flows and discount rates, but the focus here is on discount rate impact. The primary result of lower tax rates will be a higher after-tax cost of debt, which results in higher WACCs (all else equal). 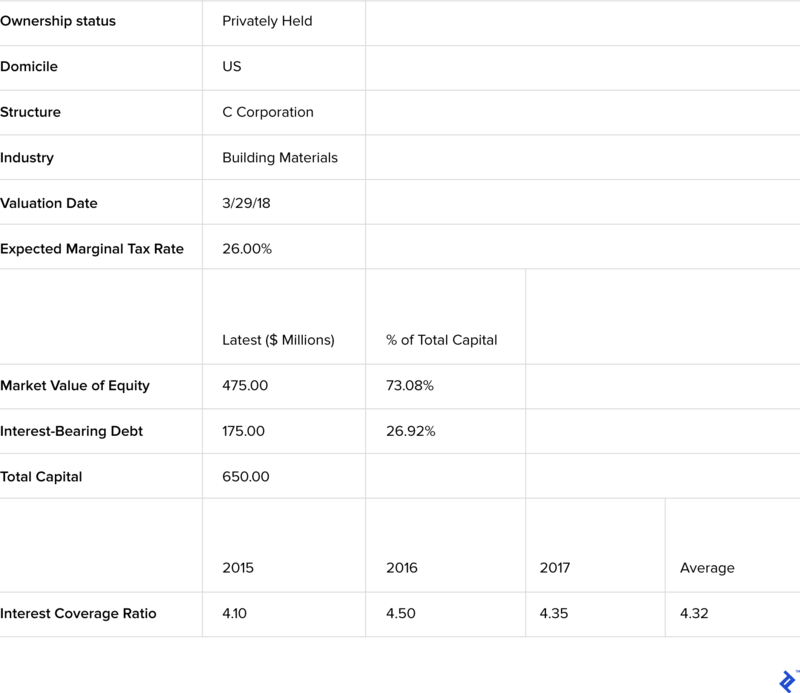 Given the pretax cost of debt of 4.59% and assuming an expected marginal tax rate of 26%, the table below presents the calculation of Company XYZ’s after-tax cost of debt. The cost of equity is the return required by equity investors, which adequately compensates them for the risk assumed by investing in a given company’s equity. There are several models that can be used to estimate the cost of equity, including the capital asset pricing model (CAPM), the buildup method, Fama-French three-factor model, and the arbitrage pricing theory (APT). This article will focus on CAPM. Despite criticism following its introduction in the 1960s, CAPM remains the most widely-used method to estimate the cost of equity. CAPM estimates the rate of return on common equity as the risk-free rate, plus an expected market return over the risk-free rate, multiplied by the “beta” for the stock. Application of CAPM also includes consideration of a small stock premium and company-specific premiums. The formula for CAPM is as follows. The risk-free rate is the theoretical return associated with an investment where the expected return equals the actual return. A valuation of a US company typically uses the YTM on the 20-year US Treasury bond as a proxy for the risk-free rate. The yields on US Treasury bonds are considered “risk-free” in that if they are held to maturity, their risk of default is assumed as negligible. It is also commonly assumed that a business will operate as a going concern and that the time horizon is inﬁnite, which supports the use of a long-term risk-free rate. The risk-free rate was 2.85% as of March 29, 2018 based on the 20-year US Treasury yield. The beta coefficient is a measure of a company’s stock returns relative to overall market returns. An “average risk” stock with a beta of 1.0 would have volatility of returns equal to the general market (typically measured by the S&P 500). A stock with a beta higher/lower than 1.0 would have a volatility of returns higher/lower than the overall market. It is best to consider as many sources as possible in estimating an appropriate range of beta. Judgment will be required as the various calculation methodologies may return a wide range of beta for the same company. All equity beta calculations require stock returns (daily, monthly, annual, etc.) over time, which do not exist for private companies. Given that a privately-held company does not have publicly traded equity, the same comparable company set used for the cost of debt analysis can be utilized to estimate a reasonable range of beta for the subject company. Linear regression of 60 months of historical stock returns against market returns with the resulting slope equal to the stock’s levered beta. Bloomberg raw historical and adjusted betas, with the adjusted beta assuming that all company betas regress toward the market beta of 1.0. The Bloomberg adjusted beta = ⅔ * Raw β + ⅓ * 1.0. MSCI Barra historical and predicted company betas. The predicted betas are estimated by a proprietary model that considers risk factors such as size, yield, P/E ratio, and industry exposure. Please note that the betas provided by common sources are levered equity betas, which need to be adjusted to an unlevered (or asset) beta to remove the impact of debt from each comparable company’s beta. Also, cash (assumed to have a beta of zero) is included in the unlevered beta and when accounted for increases the unlevered beta estimate. The cash adjusted unlevered beta provides the beta of the operating assets of a company. The selected operating asset betas are then re-levered at the target debt ratio of the subject company. 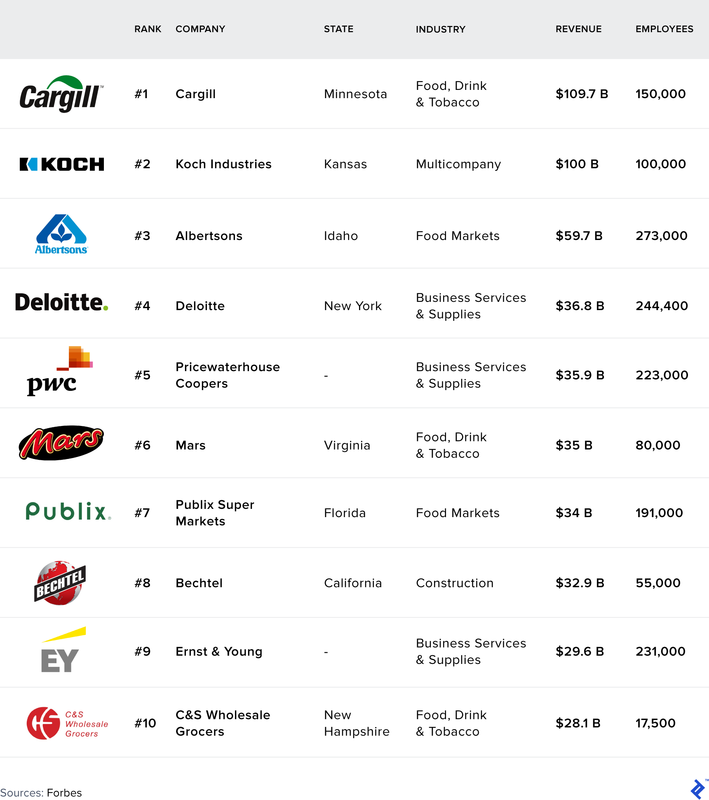 Industry, or sector, betas can also be instructive in estimating privately-held company betas. 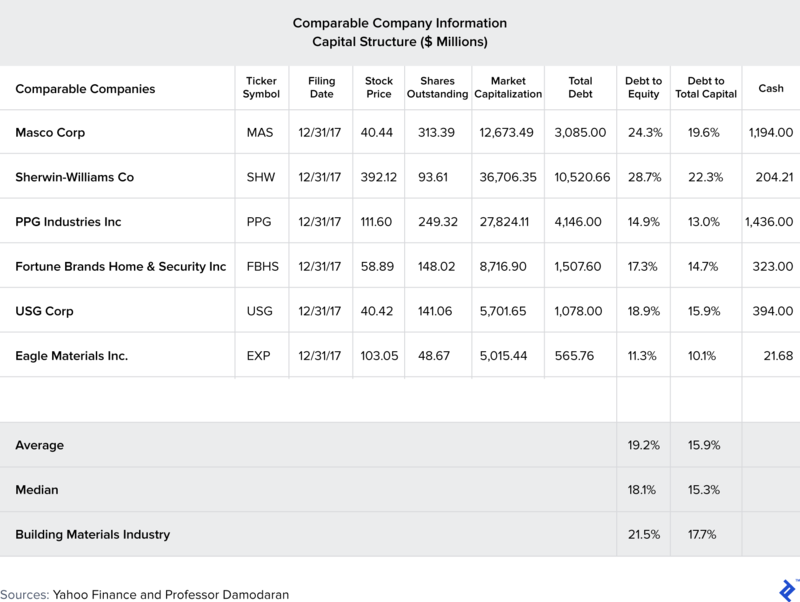 Professor Damodaran maintains a table of estimated betas by sector, which includes 94 different sectors (see below for a sampling). Note that cash adjusted unlevered betas in the table range from 0.2 to 1.36, which indicates the low volatility (risk) of utility (water) stock returns relative to market returns and high volatility (risk) of drugs (biotechnology) stock returns relative to market returns. 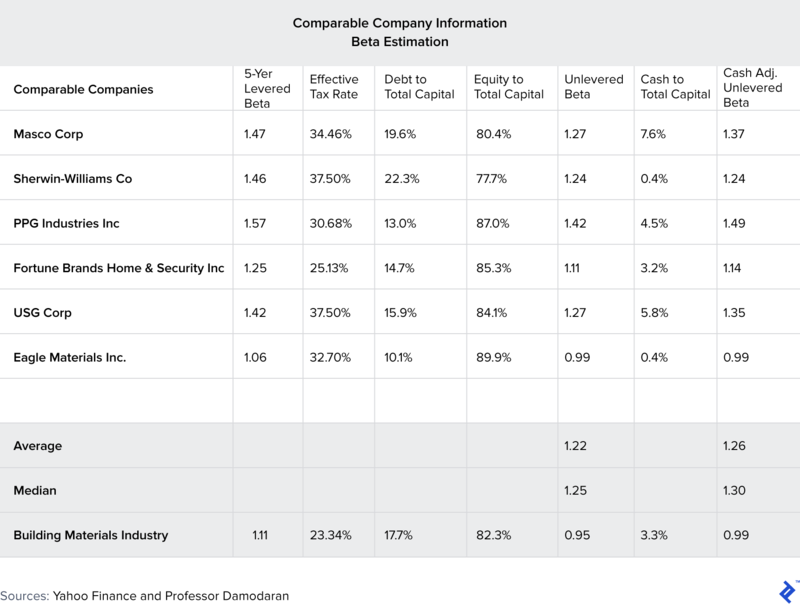 The beta estimation for Company XYZ considered industry-level information and comparable companies to estimate a range of estimated betas and target capital structure (used to re-lever the selected betas and discussed in a later section) for Company XYZ. A range of unlevered betas of 1.0 to 1.3 was selected based on the comparable companies and the building materials industry. The target capital structure range selected was 15% to 20% debt to total capital (see Capital Structure section below for details). The table below contains the range of calculated re-levered betas using the unlevered betas and target capital structure range for Company XYZ. 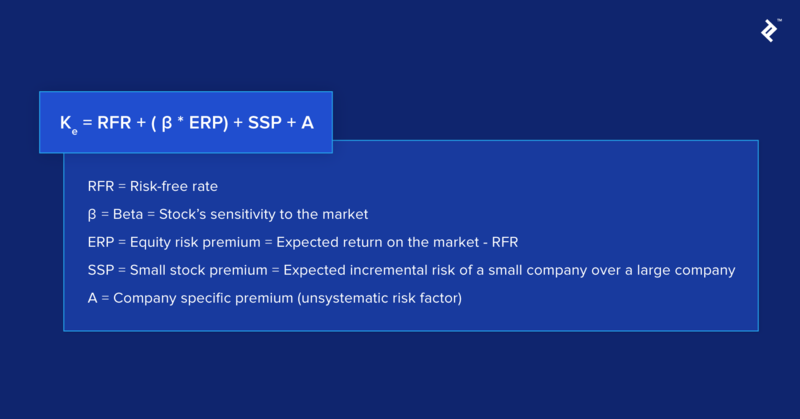 The equity risk premium (ERP) is the expected market return in excess of the risk-free rate, which investors require for investing in large capitalization stocks. The ERP is not directly observable through a simple market derived data point, and ultimately requires judgment by the analyst following consideration of various sources. I’ll proceed by summarizing a few sources and common estimates of the equity risk premium. While there is no consensus on the “correct” ERP, ERP estimates typically range between 4% and 6%. Based on the latest implied ERPs (as of March 1, 2018) from Professor Damodaran, an estimated ERP of 5% appears reasonable. Small companies tend to be more exposed to certain risks (access to capital, management depth, customer concentration, liquidity, etc.) than large companies. As a result, and despite questions regarding the persistence of a “small stock premium,” it is common to consider and apply such a premium in most private company valuations. Size premiums are estimated annually by Duff & Phelps in their Valuation Handbook – U.S. Guide to Cost of Capital. The size premium is calculated as the difference between actual historical excess returns and the excess return predicted by CAPM for deciles determined by market capitalization. Consistent with the theory that smaller companies have more inherent risk, the calculated size premiums increase as the market capitalization of the deciles decrease. You will need an estimated market value of equity to select the appropriate small stock premium, which is circular in nature as the concluded discount rate will impact the company valuation. Based on the information provided for Company XYZ, its equity value was $475 million, which falls into the 9th decile. Therefore, the range of small stock premium selected was 2.75% to 3.75%. Company-specific risk premiums are intended to account for any unsystematic risk not already captured by other factors included in CAPM. Some reasons utilized for the inclusion of company-specific risk premiums in a cost of equity estimate include projection risk, customer concentration risk, inferior management team, key employee risk, and limited liquidity. While these factors can be identified and reviewed, quantifying an appropriate premium will ultimately rely on the judgment and experience of the valuation specialist. The lack of generally accepted support for quantifying adjustments can lead to disagreements between valuation professionals and tax authorities (or other reviewers/auditors). Any incremental company-specific risk premium must be defensible and the analyst must ensure it does not “double count” a risk factor already captured in the other inputs (primarily the small stock premium). For Company XYZ, there are no additional company-specific risks present that would require inclusion of an additional risk premium. The table below summarizes the calculation of the levered cost of equity using the inputs discussed in the sections above. Having established methodologies to estimate the cost of debt and cost of equity, the target weights of debt and equity in the capital structure are the remaining inputs. The target capital structure for a private company is typically based on those of comparable companies and the subject industry. The same set of comparable companies and industry used to estimate beta were considered to estimate the target capital structure for Company XYZ. The information above indicates that the comparable companies have a debt to total capital in the range of 10.1% to 22.3% with an average and median of 15.9% and 15.3%, respectively. The overall building materials industry has a debt to total capital of 17.7%. Based on this information, a reasonable target capital structure range would be 15% to 20% debt to total capital for Company XYZ. With the target capital structure, we can plug the variables into the WACC formula to estimate the discount rate for Company XYZ. With estimates for all of the necessary variables, we can apply the WACC formula presented earlier to estimate a range of WACC for Company XYZ. The following table presents these calculations. Note that the estimated WACC is on an after-tax basis. The discount rate must be estimated on the same tax basis as the cash flows (i.e., if the cash flows are after-tax the discount rate must be after-tax). Also, note that further adjustments to the discount rate are required for S-corporations and other pass-through entities. The WACC is the weighted average of the expected returns of the two primary capital providers to the company: (1) debt and (2) equity. The WACC formula itself is relatively straightforward, but developing estimates for the various inputs involves more effort for a private company than a company with publicly traded securities. This article reviewed best industry practices for estimating private company discount rates and noted several potential issues that could be encountered in this process. While this article covered the WACC as taught in universities worldwide, it also expanded on the traditional academic teachings to demonstrate how best to handle challenges encountered in practice. In the real world, most of the required variables to estimated the WACC are not simply pulled from a database and required analysis and judgment. Given the significant judgment applied in selecting inputs, remember to select inputs that are supportable based on known facts of the underlying business and projections and not inputs that will lead to a desirable valuation outcome. What is a typical WACC? The overall publicly traded equities market discount rate was estimated to be approximately 5.81% as of January 2018. Three common methods for private company valuation include: (1) discounted cash flow method, (2) comparable public company multiples, and (3) precedent transaction method. Levered beta measures the risk of a stock with debt and equity in its capital structure to the volatility of the market. How do you calculate equity in a business? Equity is the value of a company available to shareholders calculated as the enterprise value plus cash and net nonoperating assets less total debt and minority interests. 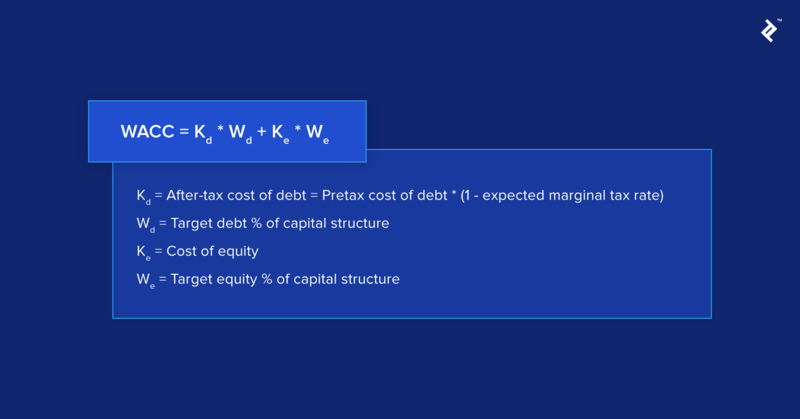 WACC = Kd * Wd + Ke * We, where: Kd = After-tax cost of debt = Pretax cost of debt * (1 – expected marginal tax rate), Wd = Target debt % of capital structure, and Ke = Cost of equity.